Home > Blog > It takes a stout heart. It takes a stout heart. You, therefore, who with lofty spirit are fired with this ambition, and are about to enter the profession, begin by decking yourselves with this attire: Enthusiasm, Reverence, Obedience, and Constancy. And begin to submit yourself to the direction of a master for instruction as early as you can; and do not leave that master until you have to. Il Libro dell Arte – by Cennino d’Andrea Cennini (15C Florence.) 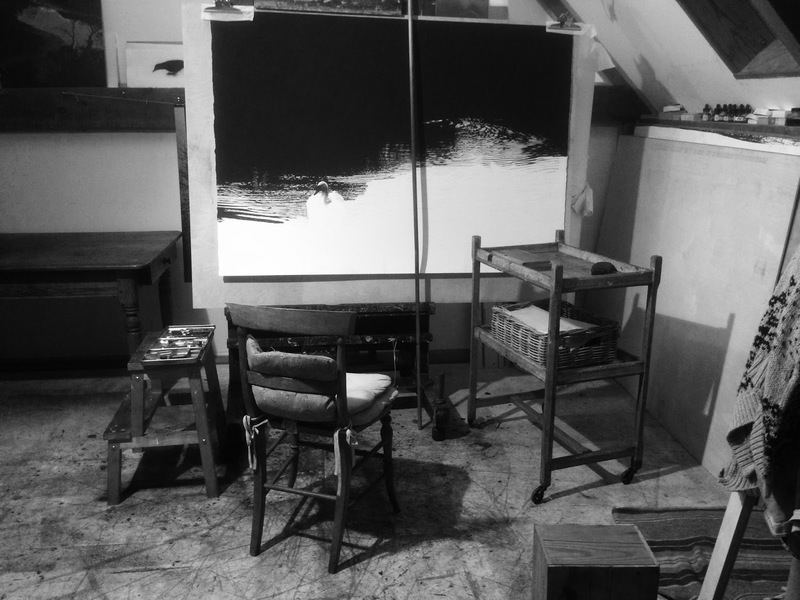 I was seventeen, owned half a dozen scrappy brushes, a few tubes of oil paint, had just arrived in Paris and this was the first thing my painting master, Patrick Betaudier, handed me to read. I read the whole thing at once – overnight. “Read it again!” Was the command the next day. In fact frequently during that year of studying 16th & 17thC methods and materials was I sent back to the little volume. I have kept a copy in my studio ever since and, though I no longer scrutinise the chapters on “The method for painting various kinds of beards and hair in fresco (LXVIIII)” or “On the character of a green called verdigris (LVI,)” and I can laugh at Cennini’s injunction to avoid indulging too much in the company of women (lest it make your hands shake!) I do still return to the introductory chapters from time to time. Call it a touchstone. Nature[..] outdoes all other models; and always rely on this with a stout heart, especially as you begin to gain some judgment in draughtsmanship. Do not fail, as you go on, to draw something every day, for no matter how little it is, it will be worthwhile, and will do you a world of good. Enthusiasm, reverence, obedience, constancy and a stout heart. How unfashionable. These days we value passion, irreverence, iconoclasm, individualism and the ephemeral. A clever idea carries so much more weight than a good heart. The digital dispenses with such dreary and uncomfortable notions as daily practice and we are so far from nature we barely know where to start. Two exhibitions from the many riches offered in the last year: Agnes Martin at Tate Modern and the Silverpoint drawings in room 90 at the British Museum. Worlds apart and yet both shared a quietness that has stayed with me. It wasn’t particularly helpful to know that Agnes Matin suffered from schizophrenia. Her constancy and obedience to her own light shone through the surfaces of the canvases, silencing young and old in the huge Tate rooms. 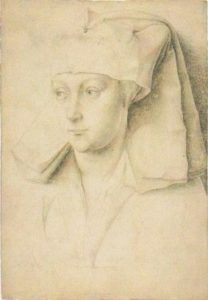 The gold and silver-point drawings at the BM were much harder to look at. Room 90 is necessarily dimmed to preserve the paper. The drawings are small, the contrast low, delicacy is all. It’s a difficult technique rendered more or less obsolete, initially by the need to make large ‘cartoons’ through which charcoal could be ‘pounced’ for wall-scale fresco design and then by the advent of lead pencils, ink, modern paper brighteners and so on. 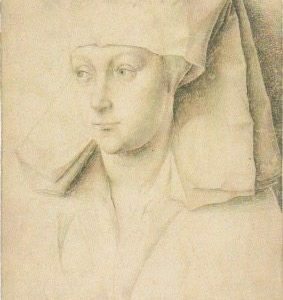 What struck me, aside from the humility and honesty in the exquisite drawings by Roger Van der Weyden, Holbein, Durer et al, was how bad we have become at looking at things. Spoiled as we are by the quick win and easy viewing of a brightly coloured, back-lit screen, it took some effort to slow the heart down, adjust the eyes and enter into these tiny, 400-year-old pieces of tinted paper and their language of hard-won marks. How to be quiet, to trust to daily practice, to keep a stout heart in times such as these? The art-world won’t help you – mad, facile and celebrity-driven as any other. It’s not a good place to get lost in. So, as the year ends my mind turns again to Cennini, to the hand-made, the darkness, to the finches in the apple tree, to Bach, to my family, old friends, the warmth and simplicity of my dog, to devotion, to poetry and the constancy and silence of the studio. not bringing me to the revealed. Still I kept on praising them. I cast my body upon the earth. and kept on praising them all. The glories refused to shelter me. Nothing explained, nothing brought to bear. but nothing was ever revealed. We enter the fields of memory and devotion. Allow me to thank you from all the language there is in that. and speech to the unspeakable. To the light that shines without shadow, I gave myself.